Turn on safe blue light and watch DNA separation at any time. Take a picture with your phone, tablet, or camera. 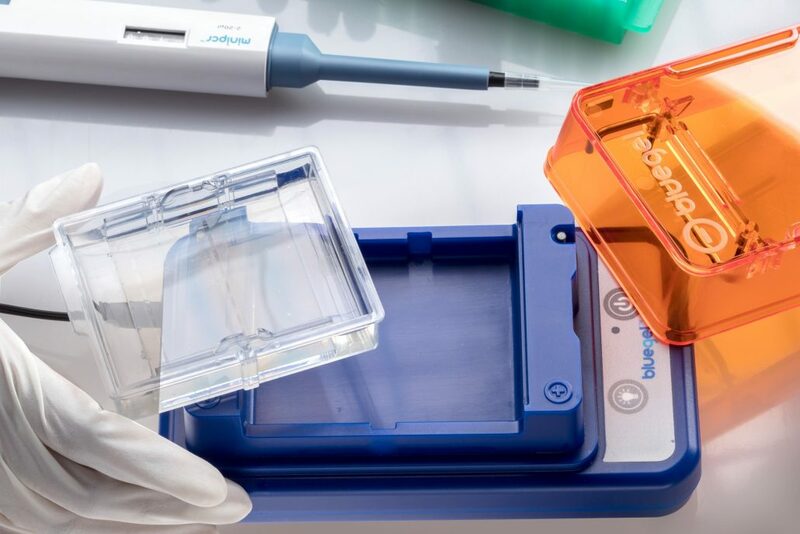 Observe DNA separation in as little as five minutes! Uniform lighting. No edge artifacts. New! – A portable, foldable darkroom. Image capture even in brightly lit rooms. 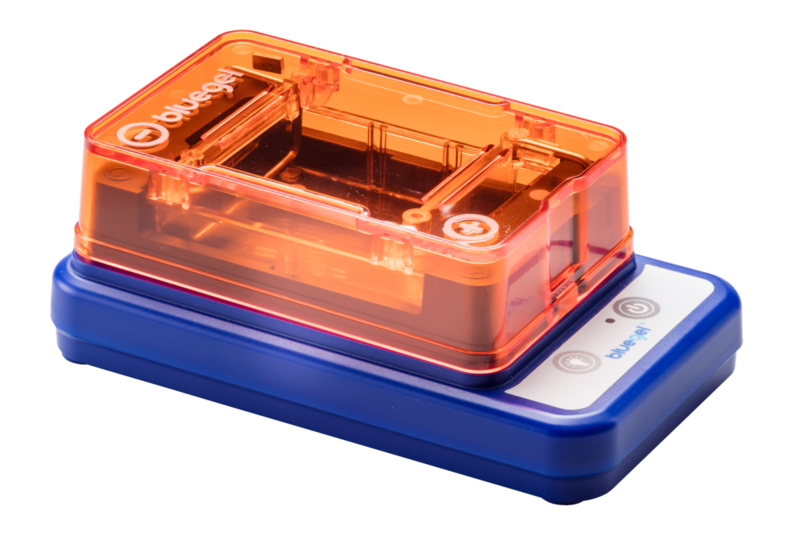 Utilizes blue LED light and safe green DNA dyes. No need for UV protection or ethidium bromide. Load and run gels safely without possibility of electric contact. Runs fast on low voltage (48V). No UV damage to DNA for downstream applications. 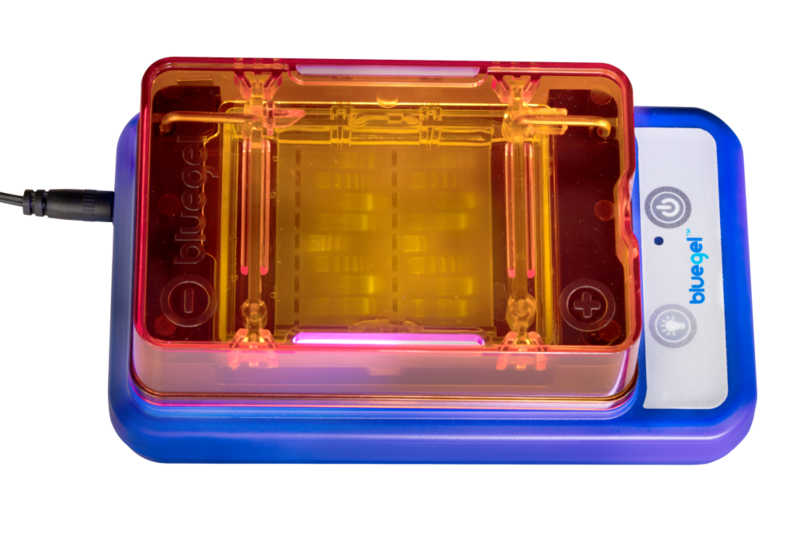 blueGelTM agarose gel and electrodes only fit the right way. Never run a gel backwards again. Seamless casting tray eliminates leaks. 6 cm. gel length separates tight bands. 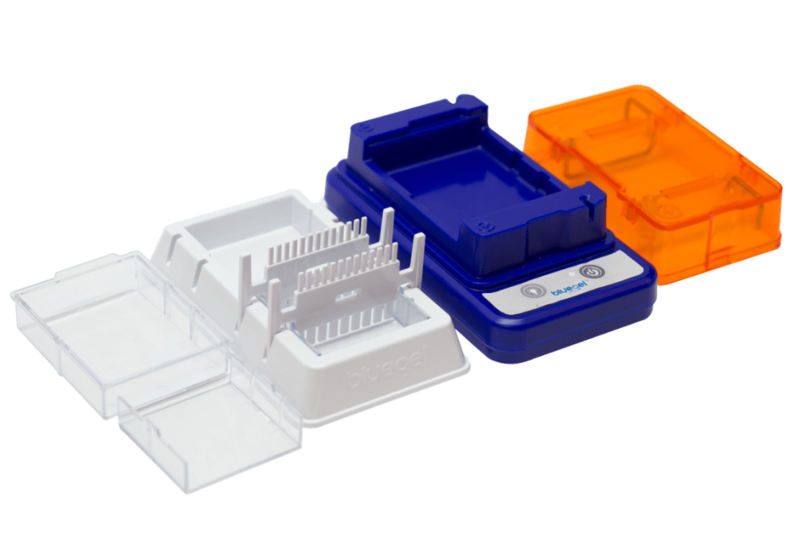 Flexible comb configuration allows for 9 to 26 wells per gel. Fitted with comb holder for easy storage. Integrated electrophoresis, power supply, and transilluminator. Simply plug into a wall outlet. Uses up to 10x less reagents. Low energy consumption. Weighs less than one pound with a small 9″ x 4″ x 3″ footprint. Stacks and stores into included travel bag. System includes: electrophoresis and transillumination units, one casting platform, one buffer chamber, two gel trays, two combs, Fold-a-View™, universal power adapter, and carrying bag.